Published 2009, 123 pages, 10″ x 8″. 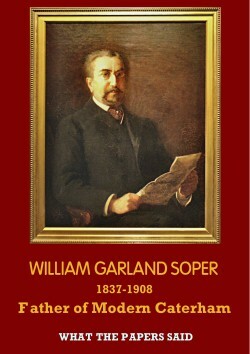 This large, fully illustrated book edited by the Bourne Society’s vice-president Gwyneth Fookes, details the life of William Garland Soper, an extraordinary man, widely regarded as the father of modern Caterham. It also covers the restoration of his grave and celebration of his life in 2008, and his family home, ‘Harestone’ in Harestone Valley Road, now sadly demolished.